Knoppix - The Fractal Core - Off Topic Discussion - You have arrived in the LEXXVERSE where the spirit of Lexx lives on. After reading of the recent computer troubles of some my fellow Lexxians, I thought I'd share this information related to one possible solution for such problems: an upgrade to a completely non-Windows, non-Microsoft, non-$$$ operating system called GNU/Linux. Analogous to the multi-user Unix operating system used in many institutional computers such as at universities, GNU/Linux is "open source" software; meaning that its source code is freely distributed. This enables programmers to modify it in a variety of ways, with the only caveat being that the resultant code must always remain free. This system and the associated software which runs on it is created by computer users, for computer users, with no profit motive involved. The particular flavor of Linux I've been using is called Knoppix and is notable for its capacity to run a computer without actually being installed on the hard drive. Knoppix runs as a "live cd" in the computer's CD/DVD reader -- or even a USB flash drive. Knoppix 7.05 disc images -- iso files -- can be downloaded to burn both CDs or DVDs. The CD version contains the operating system and a bunch of basic software such as video and music players, advanced word processing and spreadsheet software software and web browser, but the DVD is absolutely packed full of stuff. I burned the DVD which, for instance, has a bunch of free games. 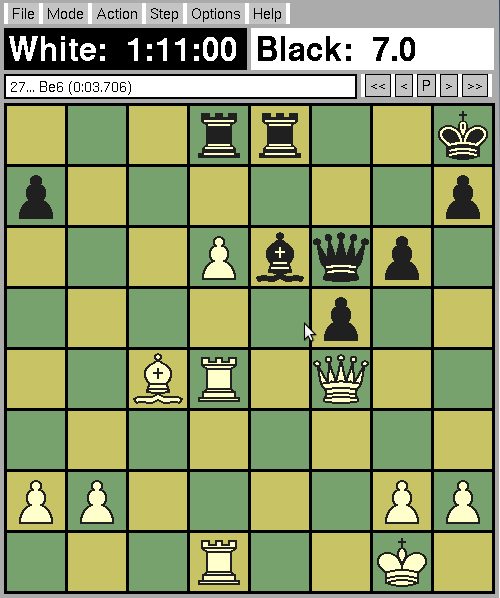 I have been playing chess against the Fairy-Max engine in Xboard -- giving myself a 1000:1 time advantage so I've got a fighting chance, though I'm getting good enough to avoid being checkmated in less than thirty moves most of the time otherwise. And there's many other fascinating and intelligent games too -- as well as totally retro ones which date from the time when computer games were mostly played on line printers. Another game I find especially worthy of mention is called Pingus. Pingus is a cartoon engineering puzzle game with an underlying environmentalism message. In the game, one directs these little penguin characters in various activities to free themselves from confinement... without sacrificing too many individuals in the process. A number of talents or special skills can be assigned to the little penguins such as burrowing and bridge building. They need to be made to work together for their ultimate success. Very amusing sound effects -- especially when as sometimes neccessary you consign one of them to its the self-destruct feature and it berates you with a pithy two-syllable utterance. Knoppix may not be for everybody; it's not as widely used as Bill Gate's thing, so you probably won't be able to ask your coworkers or friends for help with it, but there is a big online community as a resource. How did this get in here? This has nothing to do with Knoppix. I haven't figured out how to do it yet, and part of the reason may be that I haven't actually installed Knoppix on my computer -- which I'm waiting to do until after I buy a fresh hard drive which isn't nearing the end of its life expectancy -- but Linux comes with a thing called WineTools which enables it to emulate Windows so it can run all your familiar software. Some things in Knoppix may take a bit more "hacking" skill than you are used to using, but it is free to try; and it can be used to retrieve files from a computer with a broken Windows system. One last word: unless your computer's BIOS is password protected preventing anybody from enabling a boot from the CD reader, forget about your WIndows-based password protection. Knoppix's live CD bypasses all that and such software could be used by someone to snoop in your computer without leaving a trace; you might as well know this and act accordingly.